Former Maguindanao Governor Andal Ampatuan Sr. is seen in this photograph taken on November 29, 2009. (CNN) -- Authorities in the Philippines have filed murder charges against the former governor of southern Maguindanao province and 196 others in connection with last year's election-related massacre there. Considered the worst politically motivated violence in recent Philippine history, the November 23 attack targeted and killed the wife and sister of political candidate Ismael "Toto" Mangudadatu, who had sent them to file paperwork allowing him to run for governor of Maguindanao. Thirty journalists were also among the 57 people killed in the attack. The country's justice department said Tuesday that it had charged the former provincial governor, Andal Ampatuan Sr., among others. 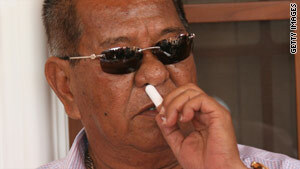 His son and namesake, who is a mayor in the province, was charged with murder earlier. An eight-member commission of the justice department said its investigation revealed a well-planned conspiracy, in which members of the Philippine police and army also were involved. "The confluence of events before and immediately after the massacre took place led us to conclude that (the governor, his son and others) connived with the actual perpetrators," the commission said, according to the state-run Philippines News Agency. Authorities recommended that all the suspects be held without bail. Before the November attack, candidate Mangudadatu said he had received threats from allies of Ampatuan Sr., saying he would be kidnapped if he filed the papers himself.